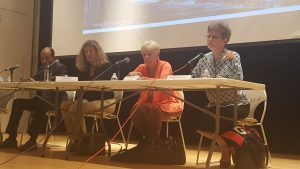 The second Community Conversation took place on October 10 at the New Rochelle Public Library. Sister Tesa, Hour Children: Sr. Tesa described her organizations work to support currently and formerly incarcerated mothers and their children. In that work, they found that a critical element of success is the ability to secure safe housing. Now they are working to establish a home where returning women and their children can feel secure so they can rebuild. She noted how consistently the experience of trauma influences the actions of these women; asked whether it made sense to have a 20 year sentence to “learn a lesson” when what is really being addressed is the need to get past a childhood that was horrific. Liz Gaynes, Osborne Association: From personal experience, Ms. Gaynes came to understand that incarcerated men (and women) are not excused from having a full role as a parent. Her organization successfully launched a program emphasizing skills needed for successful parenting despite incarceration. They’ve seen the strong positive impact of education on re-entry and recidivism, but she noted that what makes the difference in recidivism is not just education. A closer look at recidivism statistics yields insights on how hard it is to wipe the slate clean; only 10% return because of new crimes; the majority (25%) return because of parole violations. Ms. Gaynes stated that the system [of parole requirements] needs to be examined. [For more information on parole, see this list of recommended reading. Janet Donat, EMERGE/Coming Home: Ms. Donat noted that in her work, she found that it was important to encourage incarcerated parents to reflect on how they were parented. This type of reflection is supported by providing an experience of community – a place where those in re-entry are welcome, not judged, and can feel safe talking about traumatic personal history. EMERGE attempts to foster a community of parents within the facility. The Coming Home fosters that sense of community among those in re-entry. Charles Lewis, Project Renewal/Coming Home: Project Renewal offers housing to men and women coming home from prison. Coming Home offers a series of relevant learning experiences to those in re-entry; at its center is community formed around the intimacy of shared learning and a group meal. Mr. Lewis stated that the learning encompasses job search, education, social skills, relationships, and an in depth understanding of the resources and programs available to them.